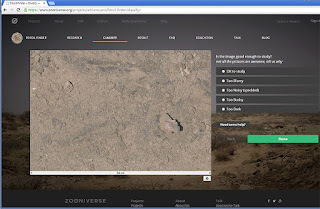 Virtual Fossil Hunting? Possible Tool for Advancing Paleotological Discoveries? Earlier in the week, I saw a BBC News story entitled "Online fossil hunters to help comb Kenyan desert" by science reporter Jonathan Webb (8 September 2015). 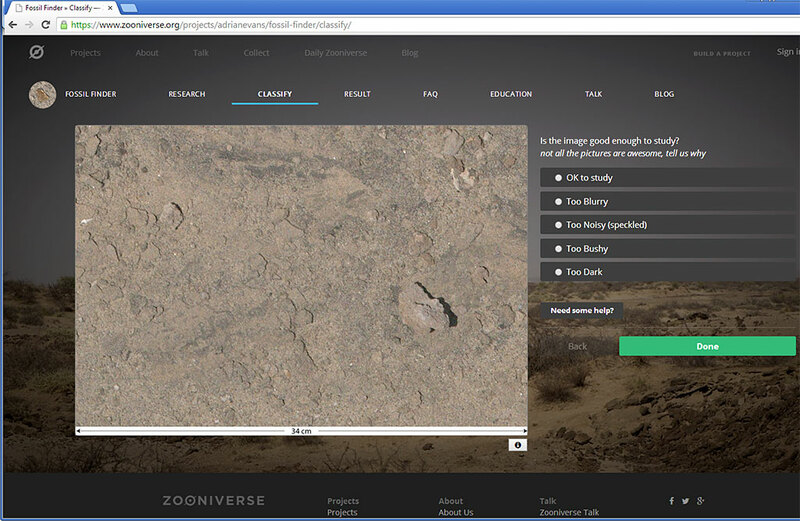 It talks about a British research web site fossilfinder.org to get the Internet's public to help find possible fossils in the Turkana Basin of northern Kenya. Fossils there date back about 6 million years. I tried it out and did not make any great discoveries for them. You are first presented with an image with a field of view of 34 cm. You answer the question about the usability of the image. Next you are asked about its composition, percentage of rubble visible in image. If there are a lot of rocks/minerals you are asked to try to mark them with a crosshair and try to classify them. 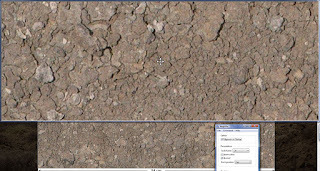 The last screen is the mark items of interest with different color crosshairs: fossil bone/tooth, fossil shell/snails, root-cast/Rhizolith, Stromatolite, stone tool, or may be something. There is a nice help section for each screen to help you by showing examples of the different classifications. My time on the website consisted of looking at four images. In the image at the top of this blog post, I identified a white spiral gastropod near the top left side edge of the picture. In another image, I think it had at least 3 root casts present. I found using the magnifier tool built into Windows to be helpful when examining the images. One can also try using the Ctrl and plus keys to magnify the browser window. Use Ctrl and zero keys to restore it normal size. A user could also clip or screen print the image and paste it into Photoshop to enhance it better. Below is the web site with the top part of the screen being used by the Microsoft Magnifier tool found in the Accessories section of Windows. I found this to be a great help when trying for find items in the ground pictures. This project seems like a good idea. Hopefully, I will be able to spend some more time trying to help them out even though my brain is more keyed to finding invertebrate marine fossils in the 300-450 million year old range.